Gareth Huw Davies - Could Tesla sweep up the Leaf and electrify the auto world? Could Tesla sweep up the Leaf and electrify the auto world? So Californian electric car manufacturer Tesla is suing the BBC over a Top Gear programme in which one of the company’s $100,000 Roadsters is said to have run out of charge during a race with a petrol driven vehicle. The BBC denies the allegation. It’s the company’s second run in with the BBC. Earlier this year a BBC reporter drove an electric Mini agonisingly slowly from London to Edinburgh, just making it to the very few charging points in the nick of time, before its battery died altogether. Critics argued that the experiment was misguided – the car wasn’t intended for long trips, and the infrastructure is in its infancy. Meanwhile somebody was driving a Tesla Roadster (range 300 miles) from Edinburgh to London without a hitch. Tesla will get its day in court (if the case ever gets there) but is its time coming in another sense as well? 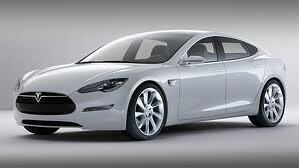 Just over a year from now, in mid-2012, the company will start selling its Model S in America. The car is still more expensive, at $49,900 after the $7,500 federal tax credit, than the much praised Nissan Leaf, released there in December 2010, and the Chevrolet Volt (starting at around $33,000, it does around 35 miles on electric power alone, with a petrol powered generator taking over when the battery is nearly discharged). But crucially the basic Model S will do 160 miles to a charge, compared to the Nissan Leaf’s claimed 100 miles, putting reasonable middle distance journeys well within range.. Model S is capable of recharging in 45 minutes using a fast charging station. The 230-mile range option car will cost about $10,000 more; the 300-mile battery option is $10,000 more again. On the Q & A section of its website, Tesla accepts that using higher consumption accessories like climate control will reduce range by approximately five to ten percent. The car will go on sale in the UK (at, presumably, around £31,000 – after the government £5k subsidy ) by the end of 2012, by which time the British consumer will have quite a choice of electric cars. Will the Tesla able to hold its own in an increasingly crowded electric field? Morgan Stanley analyst Adam Jonas said the unprofitable electric-car maker could benefit from a shift away from internal-combustion engines, to become America’s next global auto giant. It has a chance to become “a significant volume player” in the global auto industry. The US auto industry has been in the doldrums since 2008, when some of the big names came very close to collapse. If the US public start hearing what Pres. Obama is saying about ending the nation’s dependency on oil, particularly for overseas, and begins to look seriously at electric cars, it will find one, with a half decent range, and at a sensible price coming patriotically out of Fremont, California.